(NOTE: all stories and photos are now being posted again on our regular news website: www.timminstimes.com ) CLICK ANY PHOTO TO SEE IT LARGER! Timmins (May 20, 2010)- Well known Timmins-born comedian Derek Edwards likes to make fun of his May Run days in Timmins by joking about how he and his friends would try to jump over the camp fire. They won't be doing that anytime soon around Timmins. There is a complete fire ban in place by the city and the Ministry of Natural Resources (MNR). 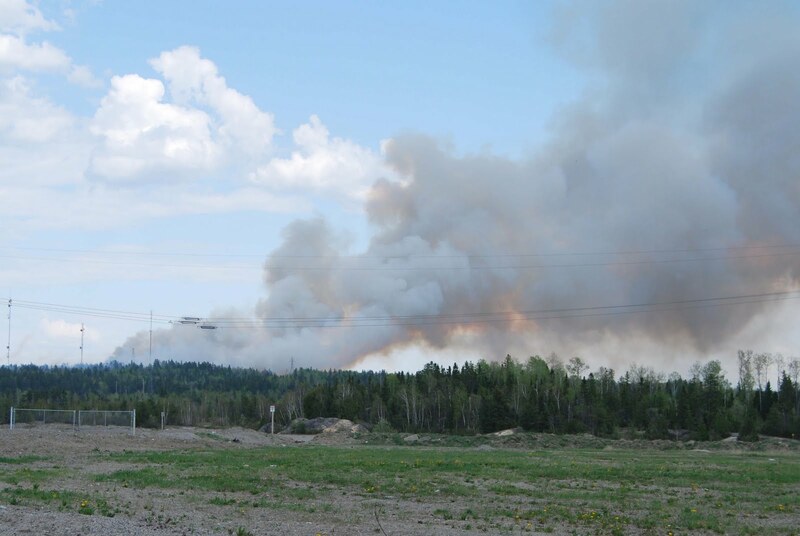 Fire Zone order for Northeastern Ontario. That takes in everything from the French River northward to James Bay. It includes May Run campfires in the Timmins area. 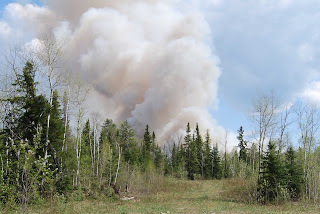 Residents are reminded that if found responsible for a forest fire, they can be charged under the Forest Fires Prevention Act and/or be liable for the costs of suppressing the fire. This cost can easily run into the tens of thousands of dollars, said the MNR. So far this year in the East Fire Region, there have been 136 fires burning 900 hectares. 310-FIRE (3473) is the new, toll-free emergency forest fire reporting phone number across northern Ontario. Early detection and reporting are essential to quickly managing forest fires. Having one number will make it easier and more efficient for Ontarians to report forest fire emergencies. The number will operate north of the French and Mattawa Rivers. 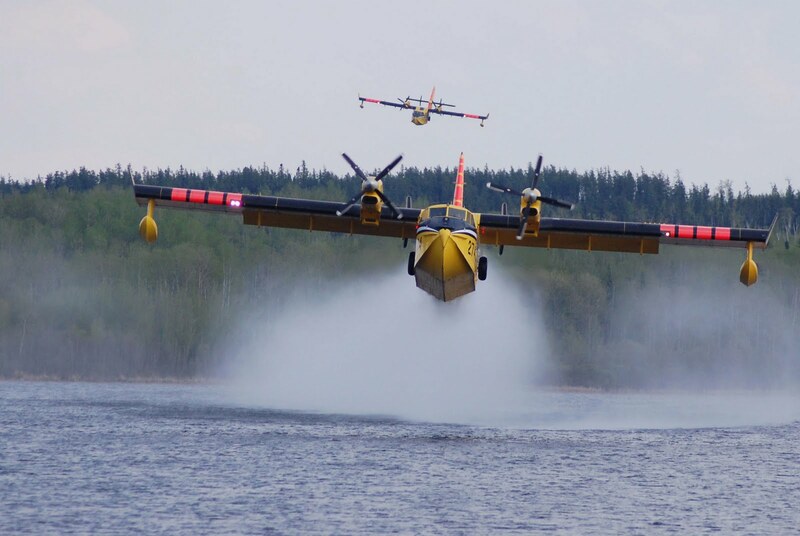 Water tanker planes and at least one helicopter were back on the job this evening over the fire known as Timmins Nine, the forest fire east of Schumacher. Smoke and flames were spotted by Ontario Ministry of Natural Resources spotter aircraft early Thursday evening and two tankers and a helicopter began dropping water in an area near one of the hydro line corridors between Schumacher and South Porcupine. The problem didn’t last long as the water bombing effort lasted only about an hour. 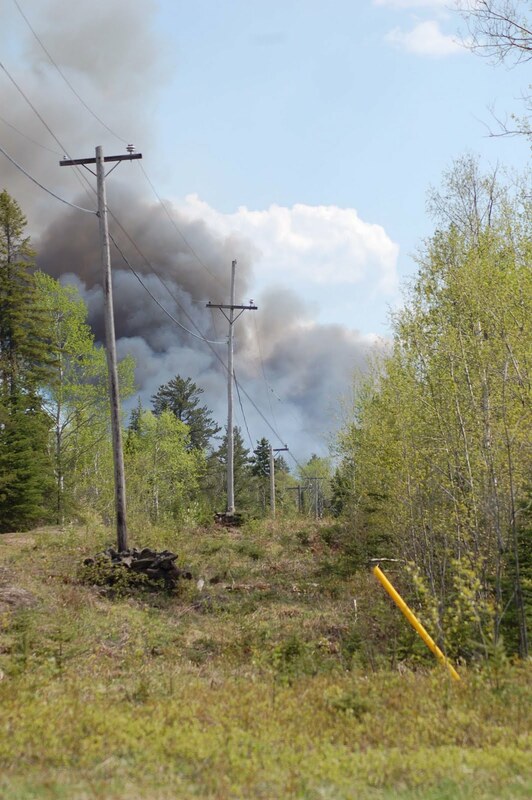 At least three MNR forest fire fighting crews were on the ground in the area, also doing fire suppression. By about 8:30 p.m., MNR crews began pulling back and the water tankers were sent back to the Timmins airport. 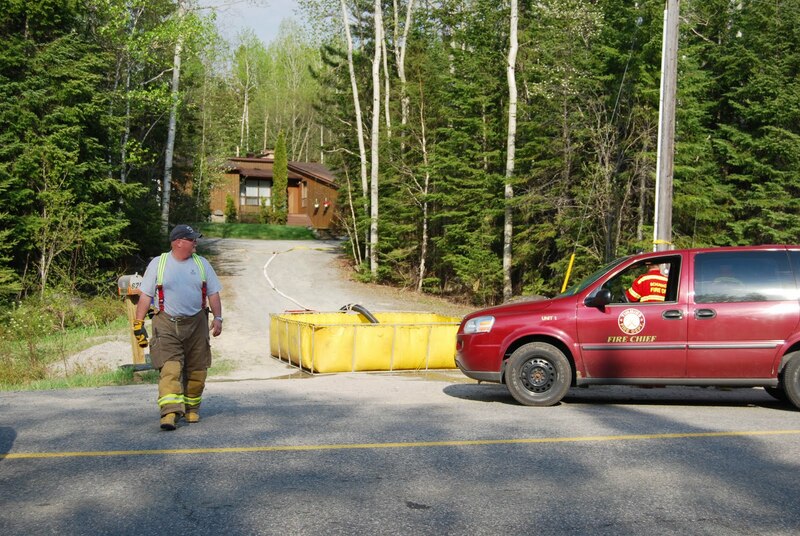 The helicopter returned briefly to a remote area east of Timmins where the MNR fire crews have set up a base camp. 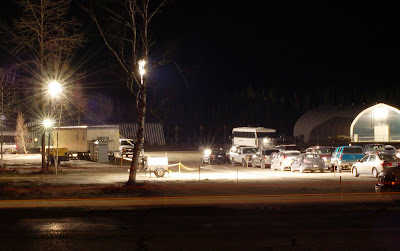 The camp is an area where the helicopter can refuel, as can the MNR heli-attack crews who are actually camped out there, living in sleeping bags and tents. As MNR official explained that the fire teams are kept at the base camp, on alert in case they’re needed quickly for any further outbreak of fire. 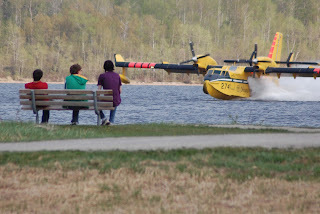 This story and the photos are also posted on our regular Timmins Times news website: www.timminstimes.com where the photo server problems experienced on May 19 have been fixed. Please bookmark www.timminstimes.com for all your up to date Timmins news and photos. 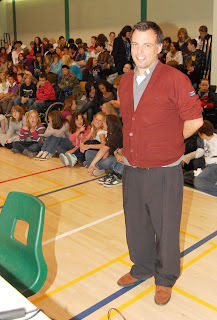 All photos on this Blog are copyright Len Gillis and The Timmins Times. 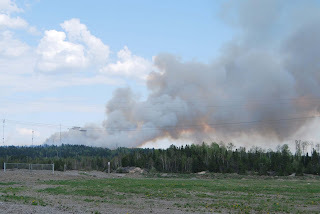 The skies over Timmins were heavy with smoke Wednesday as at least three significant forest fires flared up in the middle of the afternoon and continued into the evening. The first and worst of the fires occurred just south and east of Schumacher in the heavily wooded and hilly area near the Vipond Road. 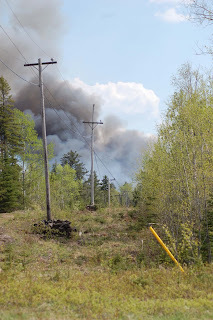 It was just before 3:00 p.m. that grey white smoke could be seen rising above the trees. Twenty minutes later, the smoke was turning light brown and black as the fire began consuming more fuel in the forest. Another fire broke out in the Kamiskotia area in the near west end of Timmins and then another fire occurred further west in the area of the Montcalm Mine Road, north of Highway 101. The fires put a huge demand on the resources of the Timmins Fire Department as men and equipment struggled to get anywhere close to the fast moving and quickly growing fire near Schumacher. Firefighters hooked up several hundred feet of what they call forestry hoses to try to put out flames on the edge of the blaze. For fire chief Mike Pintar who was on the front lines it quickly became apparent that manpower wasn't going to control the situation. The fire was "crowning", as flames raced from treetop to treetop. 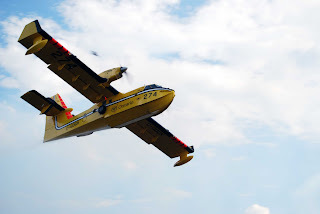 Just before 4:00 p.m. Pintar sent an urgent request to the Ministry of Natural Resource to have flying water tankers assigned to the Schumacher fire. 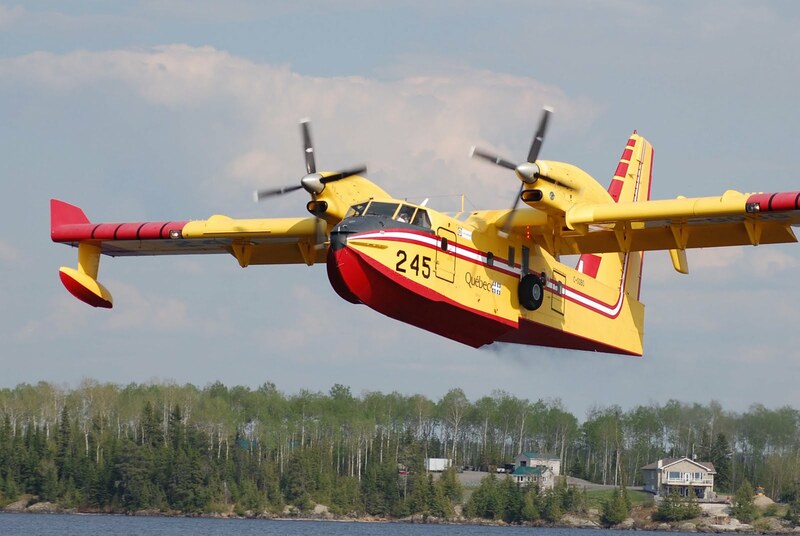 Water tankers were in the region working on fires north of Sudbury and Capreol. 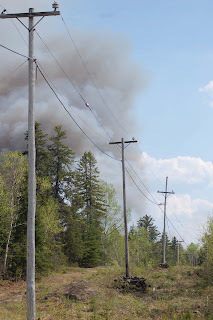 By 4:05 p.m. Pintar was on the line to the MNR demanding water tankers since the fire was by that time in sight of several homes along Gold Mine Road (the Back Road). 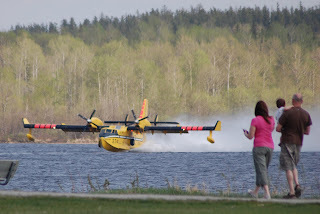 Within minutes and MNR helicopter was overhead assessing the fire and before 4:30 p.m. one Twin Otter water bomber began working the fire. 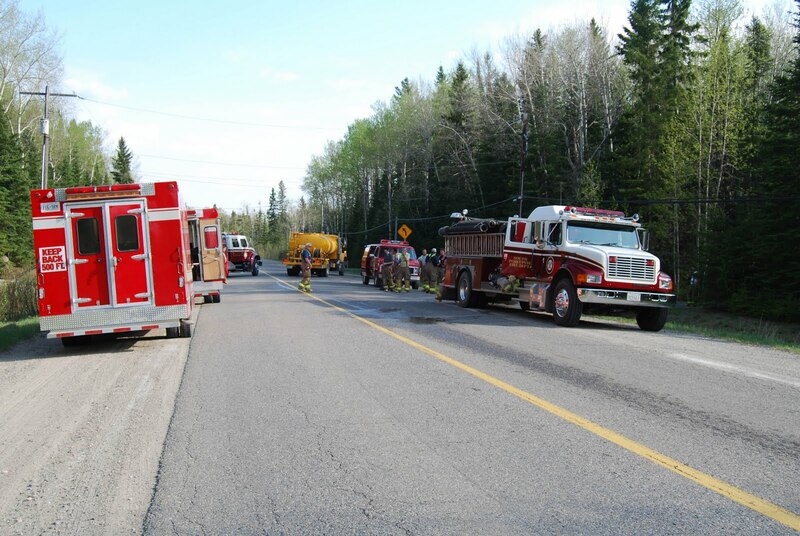 By that time, Timmins Police has closed the back road since there was heavy smoke evident, and also to make it easier for the emergency vehicles to move back and forth. While that effort was underway, it became apparent that the two other fires were flaring up in the west and being pushed along by heavy smoke. There was a concern for several minutes that homeowners living along the Gold Mine Road would have to be evacuated if the wind kept blowing more southerly, than in an easterly direction. 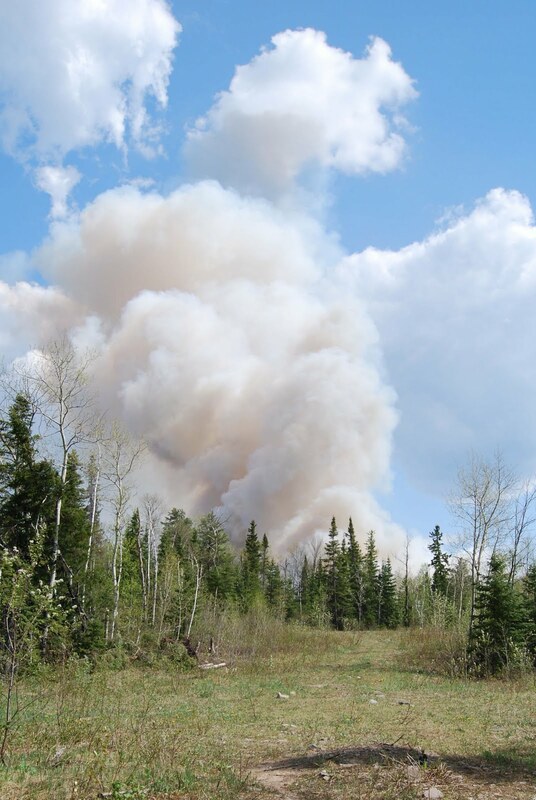 At one point, Chief Pintar notified the Goldcorp Dome Mine that if the smoke build-up were going to continue, the mine would have to be evacuated. Although preparations were made, home and mine evacuations were not carried out, according to Pintar, except for a couple of residents with pre-existing medical conditions. 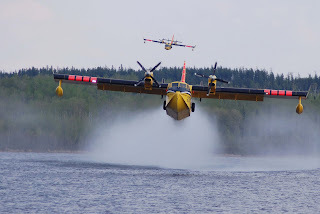 Just after 5:00 p.m. it became apparent that more water tanker aircraft were assigned to Timmins. 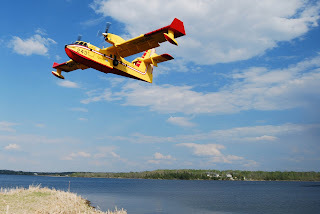 Four of the Canadair CL415 water bombers set up a carousel approach on Porcupine Lake, swooping down, scooping up six thousand litres of lake water, lifting off and heading back to the fire. Two of the tankers were from Ontario. The other two were from Quebec. Dozens of area residents, armed with cameras, stood along the shores of Porcupine Lake snapping photos. After an hour of regular water bombing this way, it became evident the tankers were having an effect as the smoke plume on the horizon over Schumacher diminished greatly. The tankers kept up the effort but soon devoted their attention to the fires in the west end. 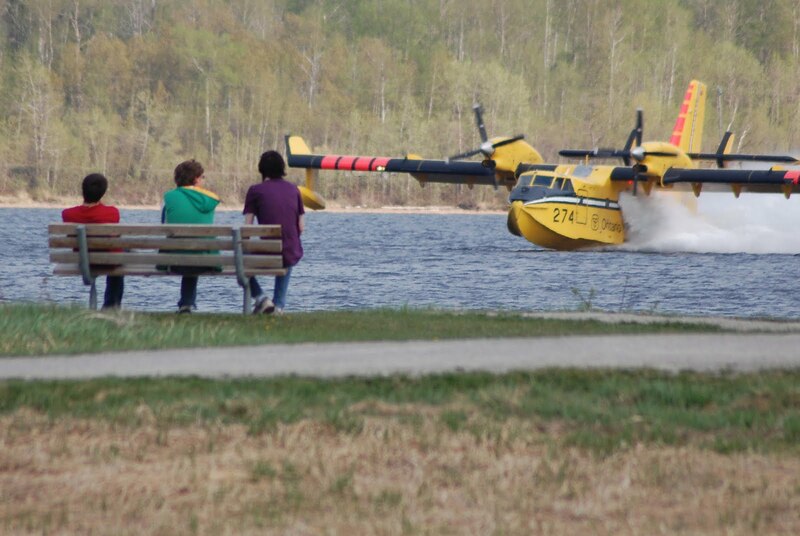 Many Timmins residents admit being momentarily startled by the massive low-flying yellow aircraft. By 6:00 p.m. it appeared that the fire was settling down, but still burning in an easterly direction. For the most part, it seems the worst of the fire is over or at least subsiding. 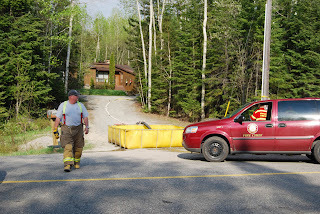 Timmins Fire Department, Timmins Police and the Ministry of Natural Resources have set up a joint command post on Vipond Road. At 7:00 p.m. Chief Pintar and the MNR took to the air to check on the situation and come up with a plan of attack. Pintar has suggested the local fire crews will have to be on duty throughout the night in case the wind causes any dangerous flare-ups. This blog is no longer active as a current news reporting medium. Please go to www.timminstimes.com and make it your local bookmark for Timmins news. Local 599 CAW in Timmins held a secondary picket line at the Xstrata parking lot at Highway 655 and Laforest Road early this morning, to slow down the effort where management workers and relief workers gather at the parking lot each morning and board buses that take them across the picket line at the Xstrata Met Site. The slow down began at about 4:30 a.m. and continued for two hours. 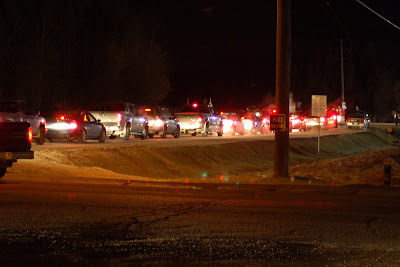 After that, the picketers staged a motorized picket by driving nearly 200 vehicles along highway 655 to the Xstrata Kidd Mine Site where traffic was slowed to a crawl for more than an hour. "Sylvia" will leave your ears buzzing! Rehearsals are in full swing for the bizarre dinner-theatre comedy treat “Sylvia” to be presented by Take Two Theatre of Timmins on October 23, 24 and 25 at the Porcupine Dante Club. 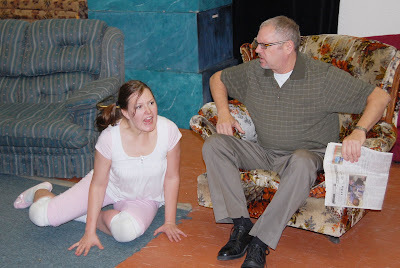 The play is about a stray dog, Sylvia, portrayed by Natalie Geddes who comes between a middle-aged couple portrayed by Graham Reid and Liliane Lachance. The cast is rounded out by players Rick Lemieux, Lindley Morrison and Jessica Bonhomme. This is no Disneyesque-type production featuring the soft-eyed pooches from Lady and The Tramp. Once you've heard the gnashing, growling and panting from Syvlia, your ears will be buzzing and your jaw muscles will be sore from laughter. Tickets are available only the Dante Club. Incidentally, this is an adult comedy that includes adult language. 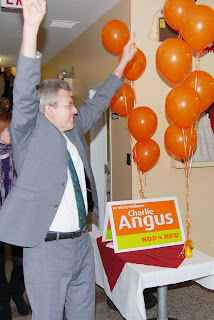 New Democrat Charlie Angus is once again the MP for Timmins-James Bay. Voters across the riding returned Angus with a strong mandate as he handily defeated Liberal challenger Paul Taillefer, Conservative Bill Greenberg and Green Party hopeful Larry Vernier. 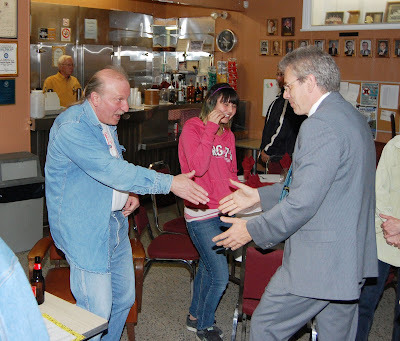 Speaking at the Porcupine Dante Club Wednesday night, shortly after being declared the winner, Angus told reporters he had a good feeling about the campaign from the beginning. “We were confident going into this because we built a great team across Timmins-Bay and we represented all the little communities,” said Angus. “When the writ was called I did a tour right through the riding and it felt strong right then,” he added. By winning a third consecutive term Angus moves to an unofficial new status as a Member of Parliament who will enjoy some sense of seniority over many other MPs and caucus members. The 46-year old writer and musician was first elected in 2004 and then re-elected in 2006. Angus told reporters he believes his record as a hard-working MP has paid off. “People in the north want someone who stands up, and shows up and fights for them. That’s what we’ve been doing in Timmins-James Bay. We won over more and more people in each election,” he said. “I mean, in my first election, I won by six hundred votes,” Angus recalled. Two years later, Angus won by more than six thousand votes. The numbers for Tuesday’s vote were not yet available, but by 10:30 p.m. Tuesday, it was clear that Angus was ahead by several thousand ballots. 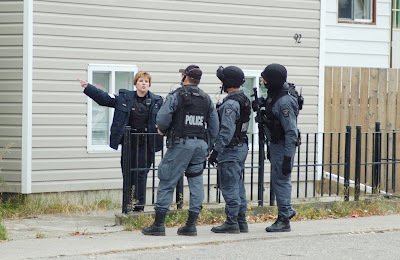 Traffic was blocked for several hours on Croatia Avenue this morning as Timmins Police responded to a domestic dispute involving a man with a weapon. Police were told by a witness that the weapon was a pellet gun, but police took no chances and responded with a negotiator and the Emergency Response Team. A woman was escorted from the scene. The man remained inside the home at the back of 92 Croatia Ave. No further details were available at noon. Police will be issuing a formal statement later today. A great moment in sport... for these guys! It may not go down as one of the great moments in sports, but it was certainly a special time for a handful of amateur hockey players who like to kick the puck around on their lunch hour at the McIntyre Arena in Timmins. 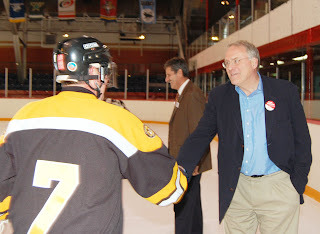 They didn't know that on this Friday, Canadian hockey great and goaltending legend Ken Dryden was right next door having lunch at the McIntyre Coffee Shop. Dryden was happy to drop by and watch the guys in action and then stepped on the ice to shake hands with the players and pose for an impromptu team photo. It will be a game to remember for this group. Consultants for the Diamond and Schmitt architectural firm have come up with a short list for five locations for a new $12 million Timmins Arts and Heritage Centre, which is the building being suggested as the replacement for the old Timmins Museum and National Exhibition Centre. The old museum building on Legion Drive in South Porcupine had to be closed in 2006 due to water and mould problems in the 25 year old building. The locations on the short list for a new building include: 1 - Highway 101 by snow dump beside the Whitney Arena, 2 - on Highway 101 between the Whitney Arena and Northern College, 3 - Bruce Avenue across from the Spruce Hill Lodge, 4 - on highway 101 beside the McIntyre Arena and 5 - on Algonquin Boulevard at the old Doran’s Brewery site. In terms of scoring the best site location by the consulting team, the McIntyre site topped the list with 36 out of a total of 40 points. Next on the list was the Doran’s site with 35 points, the Whitney snow dump with 30 points, the Whitney arena site near the college at 30 points and the Bruce Avenue site, near Spruce Hill Lodge at 25 points. The architects have laid out plans for a 28,000 square foot building that will include room for the museum and exhibition centre, room the Timmins Symphony Orchestra as well as community spaces for numerous other arts and culture groups. Regardless of what site council eventually chooses, the final decision on the project will be whether enough money can be raised to pay for it. As a publicly funded city-owned building, the new Timmins Arts and Heritage Centre at $12 million will likely be the most expensive City project ever undertaken. 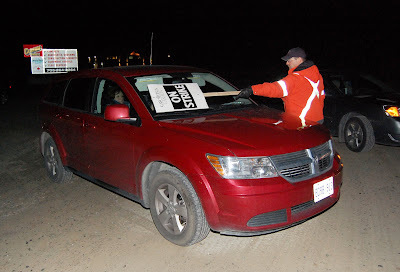 Members of CAW Local 599 begin passing out the picket signs at about 20 seconds after midnight, early Wednesday morning, upon getting confirmation that no new agreement was reached between the union and Xstrata Copper Canada. Despite reaching an impasse in talks on Monday, both sides worked with a conciliator all day Tuesday, but were not able to come to an agreement. "There wasn’t one final thing." 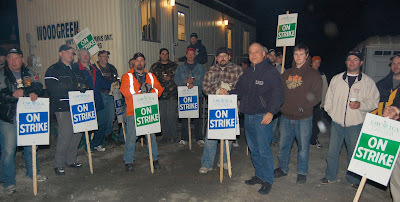 said bargaining committee chair Ben Lefebvre when he arrived at the picket line around 1:00 a.m. (see photo below, centre-right, wearing blue jacket). "It’s wages, benefits and basically contract language – seniority rights, skilled trades issues. They didn’t want to come very close to what our membership needs. It’s as simple as that." he said. "They’re adamant," Lefebvre suggested of Xstrata's corporate position. "They want to attack the union. That’s what they’re all about," he accused. "We hung in there right to the bitter end. We were hoping they were going to change their position, but obviously here we are," he told fellow union members. “Three out of four, gentlemen. Three strikes out of four contracts. A very reasonable company we’re working for here,” Lefebvre said with a hint of sarcasm. Xstrata Copper Canada says contract talks have broken down with the bargaining committee for CAW Local 599, the union that represents workers at the Xstrata Kidd Metallurgical Site in Timmins. "We are very disappointed that the Union Executives have turned down the company's contract offer. We truly believe that we presented a fair, competitive and responsible offer and in fact we were able to agree on many of the demands tabled by the union," stated Thompson Hickey, General Manager of the Kidd Metallurgical site. The Canadian Auto Workers say the latest offer did make some movement toward union demands but not near enough to be considered a serious offer. It was late last week that some three-quarters of the union members voted 96 per cent in favour of taking strike action. The unionized workers will be in a legal strike position at midnight on Tuesday. The company says it is "is finalizing contingency plans in the event the Union decides not to accept the offer." Goldcorp Porcupine Gold Mines has revealed that it intends to create three new open pit mining operations at the old Hollinger Gold Mine property. 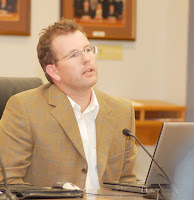 Goldcorp PGM's strategic project manager Dave Bucar told Timmins city council this evening(in photo at left) that his company intends to create the new mining operation entirely within the existing property and fenceline of the known Hollinger property. Bucar says this will allay any fears in the community that may exist about the creation of a super-sized open pit that would take in parts of Schumacher, the McIntyre Arena and the Shania Twain Centre. Bucar's revelations follow the news that was released by Goldcorp in 2007 that more than four-million ounces of gold have been identified through exploration drilling in and around the former Hollinger gold mine, one of the most lucrative gold mines in the history of Timmins. "We are now moving into a permitting phase." said Bucar "We dont have any exact timing on construction or when the mine will begin." He says the timetable will be determined according to how quickly the various branches of government give the company permission to carry out mining operations.Bucar also revealed that in order to address concerns about dust, vibrations and noise that are part of an open pit mine, the company would be creating a rock wall, or a berm, twenty metres high along the entire perimeter of the project. Goldcorp is trying to finish up the job in rejuvenating the old Delnite tailings. But there is a concern there are people in the community who are just as determined to ruin that work. Goldcorp Porcupine Gold Mines has spent hundreds of thousands of dollars on the project but avid ATV riders may see its demise, according to PGM environmental engineer László Götz. Much of the success of PGM’s rejuvenation effort is based on the plan of adding bio-solids to the tailings, thus creating a suitable base of nutrients where grasses, shrubs and trees can flourish. The company has also begun hydro-seeding the land in a high-priced effort to regreen the area. The work has been applauded by many residents living in and around the old Delnite townsite, who complained for years about dust blowing off the top of the tailings. Controlling the dust is one of the reasons why PGM is working to rejuvenate the land. The problem is that ATV riders and dirt-bikers are tearing up the reseeded areas by riding all over PGM’s private property. PGM project assistant Bev Taylor says signs and barriers are being installed at all known access points to the various tailings areas, aimed at ATV and dirt-bike riders. “They don’t always pay attention,” she admits. She says it’s not only to stop the riders from destroying new vegetation, but also for the protection of the trespassers so they don’t get in the way of the large machines. “There’s heavy trucks everywhere out here,” she explains as one of the mammoth rock hauling machines roars along the back roads bringing another load of crushed rock that is used to stabilize the slopes of the tailings dams. She adds that PGM is going to the expense to adding large boulders, weighing many thousands of kilograms, all along the perimeter at the top of the tailings. The idea is to keep trespassers from destroying the fragile re-vegetation area. PGM is hoping the boulders will discourage the ATV riders from trespassing. The continued presence of the riders is frustrating for Götz, who has watched as his efforts get destroyed. “Not only millions of dollars worth of repair work is at stake, but also the health of the nearby residents, who in the past endured dusting coming from the barred tailings surfaces, and who oh-so-loudly complained about it to the media last fall,” he said. PGM is also in the process of cleaning up the old Aunor tailings located nearby and because of the trespassers at the Delnite, extra money, materials and manpower will be spent on those tailings as well, in an effort to keep ATVers away. The bargaining committee for Local 599 of the Canadian Auto Workers, which represents the unionized employees at the Xstrata Kidd Met Site in Timmins is calling for a strike vote. Lefebvre says he is calling on the membership to hold meetings on Thursday to decide on a course of action. “On Wednesday September 24th the Company presented your Bargaining Committee with an offer of settlement that falls short of our members’ expectations. The Committee had no choice but to reject the offer and will be asking members for a strong strike mandate to back your demands. “As a result we have scheduled membership meetings for Thursday, September 25th at 3:00 and 7:30 PM at the McIntyre Community Center. The current contract between Xstrata and Local 599 expires at midnight on September 30. If there is no contract by then, the union will be in a strike position on Wednesday October 1. The relationship between the company and the union has been a rocky one in the past nine years. There have been three contracts and two strikes. 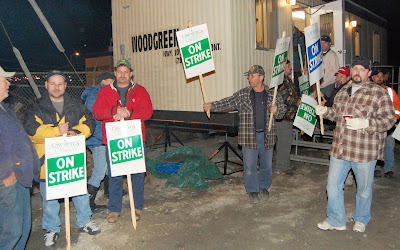 The current contract came into effect at the end of October 2005, when Local 599 went on strike for 29 days to back demands for their third contract. The Met Site workers also went on strike for 26 days back in 1999 to back demands for their first ever contract. Fill yer boots! Timmins-James Bay MP Charlie Angus and communications director Dale Tonelli were among the first to make donations to the annual Muscular Dystrophy campaign, which firefighters across Canada have been promoting for decades. 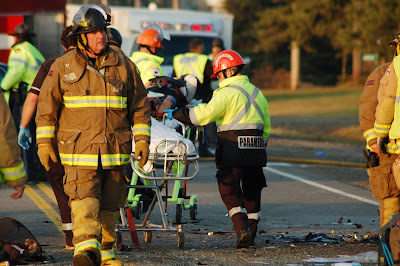 The donations were accepted by Timmins Professional Firefighter Association president Peter Osterberg. The firefighters will conduct a “boot drive” in several areas of the city on Saturday where residents can make a donation in support of medical research and Muscular Dystrophy Canada. 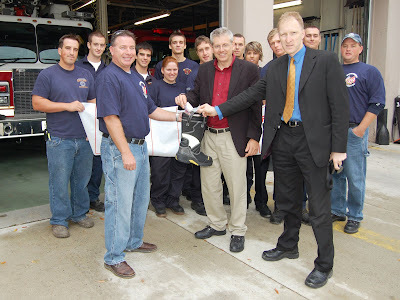 Timmins Professional Firefighters and 600 other fire departments and associations across Canada have raised more than $61 million since the boot drive campaigns began in 1954. Firefighters will be on location at McDonald’s, Your Independent Grocers, A&P Superfresh, Wal Mart and Canadian Tire beginning at 9:00 a.m. Saturday to collect donations. Timmins Police Service says several arrests have been made as the result of an armed robbery that occurred at the Canadian Tire Gas Bar early Tuesday morning. At approximately 6:19 a.m. a lone male suspect entered the gas bar brandishing a knife. The suspect punched an innocent customer and then reached over the counter removing an undisclosed amount of cash from the till, says a police news release. Police say the suspect was seen running away northbound through the parking lot. The customer who was punched was able to identify a suspect for police, who then proceeded to a home on Fifth Avenue. Within minutes, police knocked on the door of a Fifth Avenue home. The residents inside refused to come out, so police waited at the door until a search warrant was processed. 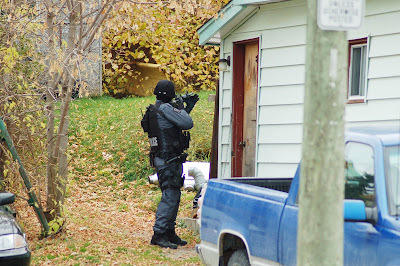 Eventually four suspects came out of the house and were arrested by police. 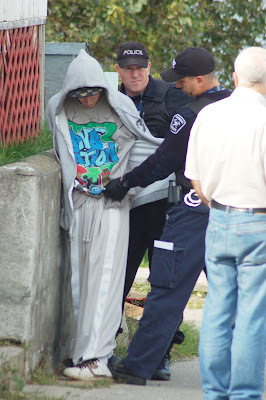 Police say the suspect involved in the robbery and weapons offence is being held in custody pending a bail hearing. In the meantime, police have launched a thorough search of the Fifth Avenue home to gather more evidence. Police say no names are being released until their investigation is completed. Heavy black smoke billowed over the southern side of Timmins this afternoon, just before four oclock, when a van caught fire on Cody Avenue at Mountjoy Street. Firefighters arrived on the scene in minutes to find the vehicle enveloped in flames. It only took a few more minutes to knock down the fire. Firefighters left the scene just before 4:30 p.m. There were no reports of any injuries. The incident is under investigation. 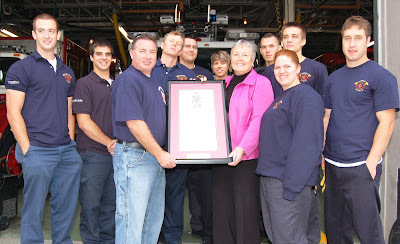 Northern College said Thank You in a special way recently when it presented a handcrafted and framed copy of the Fireman’s Prayer to the Timmins Professional Firefighters Association. Local president Peter Osterberg, left, accepted the framed prayer from Judy Rantala, who runs Northern College’s School of Health Science and Emergency Services, which includes the pre-firefighter program. 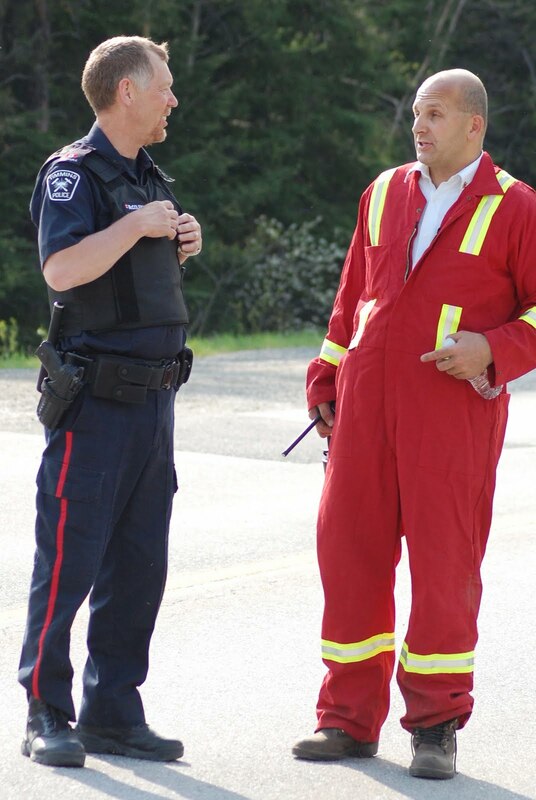 Rantala explained that the gesture of thanks was directed to the professional firefighters in Timmins who have gone above and beyond in working with the college and contributing to the success of the firefighter’s training program and, said Rantala, “do an excellent job of mentoring” with the students. The current class of students attended the firehall and hosted a barbecue lunch for the firefighters. Timmins Runner Joel Picard was the first to finish the 6K road running event in the city’s annual Terry Fox Fun this year. Picard crossed the finish line with a time of 24:45.50. 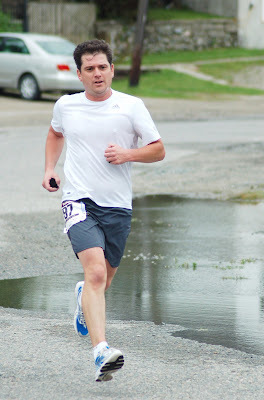 He was one of scores of running enthusiasts who ran the course despite the cooler temperatures and brisk winds on Sunday afternoon. The Terry Fox Run in Timmins this year had nearly one hundred participants who walked and ran the course, from Gillies Lake through the north end of the city and back. 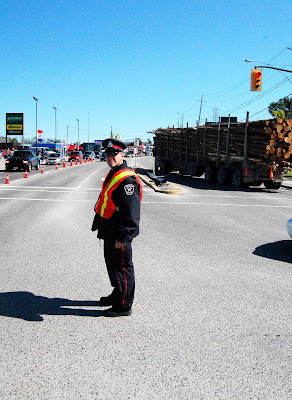 Timmins Police Constable Chris Litt had to direct traffic early Monday afternoon when a logging truck knocked down the traffic light post at Burnette Road and Algonquin Boulevard. Traffic was backed up for nearly an hour as workers cleared the debris and then worked the get all the traffic signals working again. The incident is under police investigation. 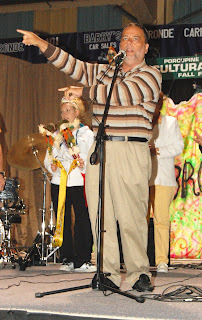 Father Marco Bagnarol is challenging Catholic students in Timmins and throughout the Northeast district to help him raise money for missions in Mozambique, in south eastern Africa. Bagnarol, originally from Toronto, is now with the Consolata Missionaries who have been working in Mozambique since 1925 to children build better lives for themselves. The challenge is to all students of the Northeastern Catholic District School Board (NCDRB) students and teachers to take action to help raise $30,000 this year. The board says the call to assist others in need fits in with the current theme of Catholic education which reminds students “You are the Light of the World” and gives students the opportunity to experience and appreciate the value of helping others. Goldcorp Porcupine Gold Mines announced today it is suspending operations indefinitely at the Pamour Open Pit mining operation, because of the dropping price of gold and rising price of fuel and other supplies needed to run the mine. The company says the work suspension will come in early 2009, once the current mining stage is completed. The Pamour Open Pit was brought online two years ago, after Goldcorp spent hundreds of millions of dollars to move the move part of Three Nations Lake to access part of the historic Pamour orebody that was below the lake and under the old section of Highway 101. The company has not indicated anything about layoffs, but the news release indicates that Goldcorp will try to relocate the Pamour workers into other Goldcorp operations in Timmins, which includes the Hoyle Pond Mine, the Dome Mine and the Hollinger project. The company says existing ore stockpiles will continue to be sent to the Porcupine mill, also known as the Dome mill. “There are roughly 160 employees working in conjunction with the open pit, maintenance, engineering and geology; over 80 of whom will be retained for mill maintenance and to mine ore from stockpiles. At this time we anticipate that existing openings at the Porcupine and other Goldcorp operations will allow re-deployment of an additional 30 people,” the news release stated. “As Pamour mining activities slow down in the first half of 2009 we will continue to look for positions to re-deploy the remainder of the workforce for whom we currently do not have opportunities,” the company news release continued. “The Porcupine mill will continue at full production by replacing Pamour open pit ore with significant ore stockpiles that have been generated over the past 14 years of open pit mining. Following the completion of mining operations the workforce will be reduced to a size commensurate with re-handling stockpiles,” the company said. “We wanted to ensure our employees had as much notice as possible and we will take the transition time we have to look for new opportunities to retain our people. 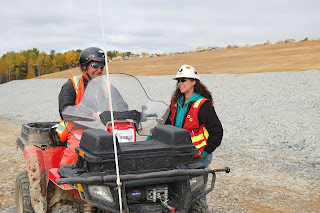 Porcupine’s other operations and projects require people and we need to focus our efforts on those operations to ensure they continue to be competitive under any market conditions.” The release was signed by Chris Cormier, Mine General Manager Porcupine Gold Mines. Gilles Bisson has become a pépère. The Timmins-James Bay MPP announced at the Porcupine Fall Fair Friday that his daughter Julie and her husband Chris Gardner are the proud parents of a baby boy, young Nathaniel Gilles, who was born on Wednesday. Bisson told the fair audience that he, and his wife Murielle, were both pleased and trying to outdo the other in seeing who could hold the baby the most. Nice Donkey! It’s something Shrek might say, but visiting the donkey was one of the many attractions for sight seers at the annual Porcupine Fall on the weekend. 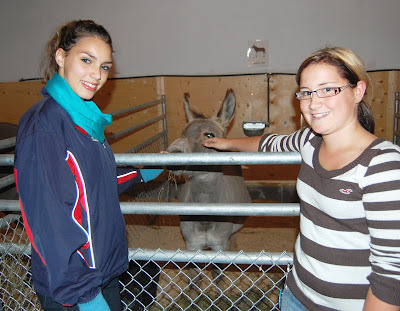 Among those who visited the live animal displays were Marissa Baril, left, and Kayla Mason. Which way is up? 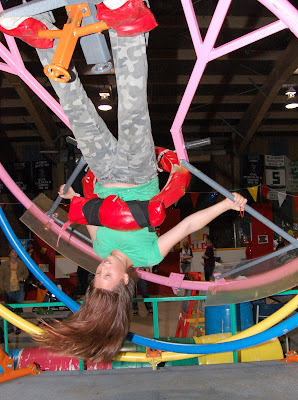 Jillian Nemis of Timmins might have trying to figure that out as she enjoyed a “spin” on the Gyro Scope at the Porcupine Fall Fair on the weekend. The gyro device was one of the popular ‘hair raising’ attractions at the fair set up by Climb ‘N’ Fun, a Timmins based entertainment venture. Just hanging around! Seven-year-old Bailey Whissel of the McKinnon novice hockey club was one of many youngsters who tried the endurance “hang-on” device at the Porcupine Fall Fair on the weekend. The device was set up for youngsters to try to out-do each other in how long they could simply hang onto a bar while suspended above the ground. 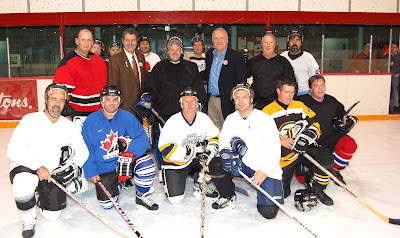 The event was a fundraiser for the McKinnon hockey club. Cutting it close. 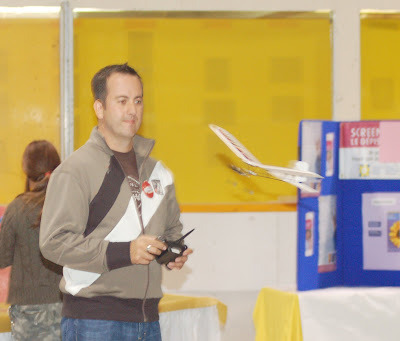 Perry Gauthier of Sudbury showed off his model flying skills at the Porcupine Fall Fair on the weekend. 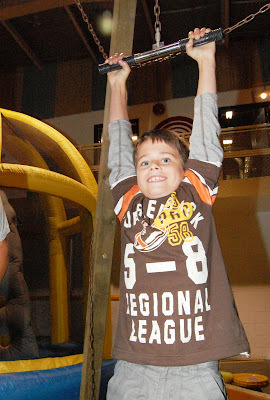 Gauthier was on hand as part of the Science Timmins display at the fall fair and delighted many youngsters by flying robotic model aircraft inside the Mountjoy Arena.